As you might know, my husband Ryan is a fisherman. Dedicated, crazy and obsessed with fishing, he will stand on the shores of Cape Cod surfcasting for striped bass in a nor'easter, took his groomsmen on a tuna fishing trip in Canada for his bachelor party, and will stay up for 36+ hours straight, all to catch just one more fish. He's nuts. 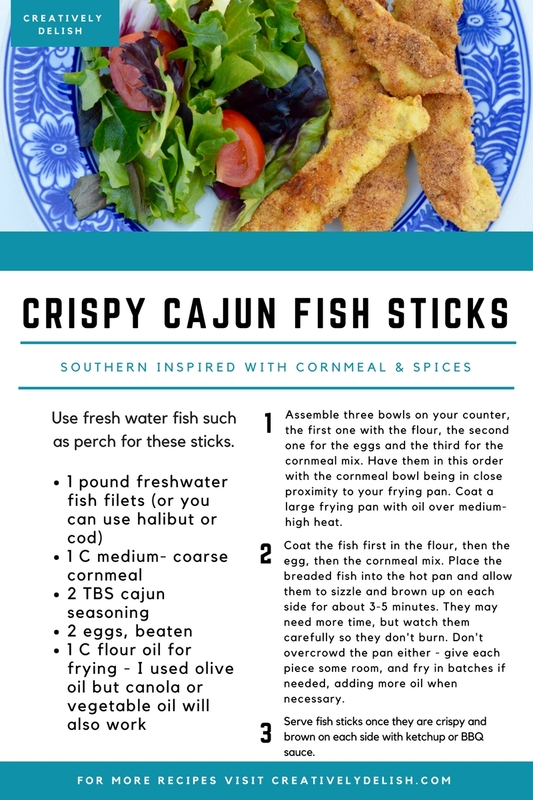 But the reason for this recipe is him, of course, because it may be 8 degrees with a wind chill of -2, but there's always ice fishing! So as if it was a morning in July all over again, the alarm went off at 5am and he was out the door before the sun came up, all bundled and eager to catch fish. 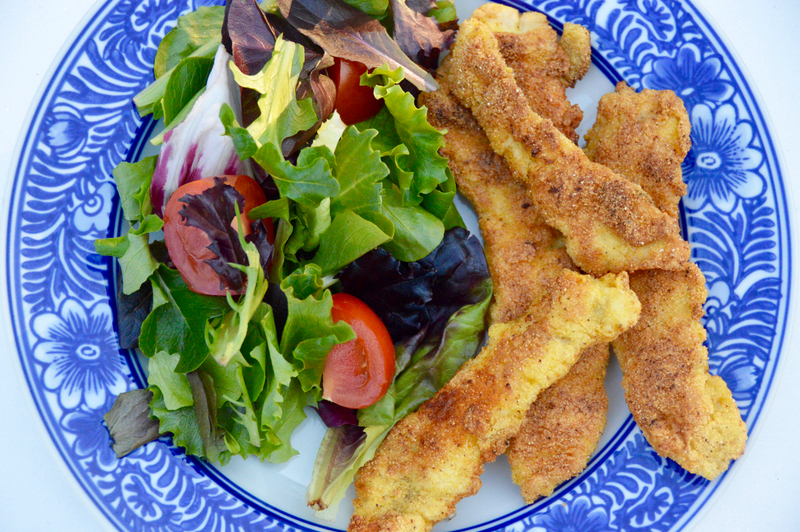 He arrived home with a bucket of yellow and white perch, and immediately I knew exactly what to do with them. A few years ago I had finally convinced Ryan that it was time to go down to South Carolina with me to stay with my parents...for a week. They already loved him, referring to him as the hopeful future someday son they'd never had, and so I don't think the anticipation was all that stressful for Ryan. Of course in the south, people are welcoming, friendly and always eager to feed you, so when word got around the neighborhood that the boyfriend my parents referred to as "The One" was coming to town, you better believe there was a block party to welcome him. Because why not? It's the south! It was a low country boil, which is similar to a clam bake in New England, complete with crawfish, corn, sausage links and potatoes, all dumped out on a table for the taking. It was delicious, but what I remember most about that meal was what came right before it, fried crappie (nice name, huh?). 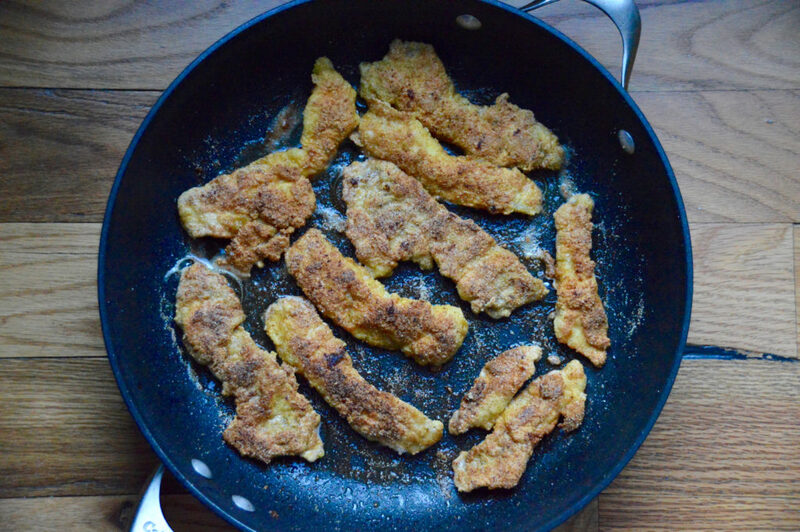 Crappie is basically a small white flakey fish that is delicate but perfect for breading and frying in some cornmeal and spices. They served it on a plate and I don't even remember there being ketchup or any other dipping sauce, because you didn't need it. The cornmeal and spices were the perfect amount of flavor for those little guys. So that's of course how we wound up here, with my own version of that favorite, also referred to as a grown up fish stick. 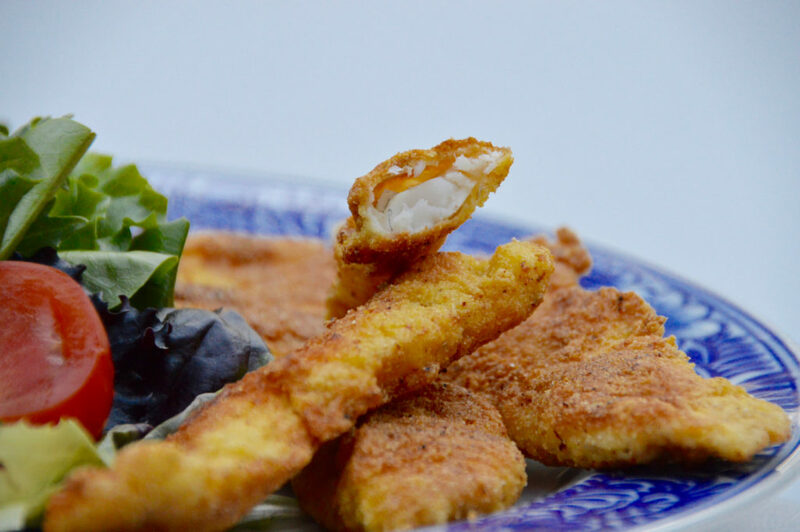 When breaded and lightly, slowly fried the right way, the outside turns extra crispy while keeping the fish moist and flakey - not dry. To get the right amount of crispiness, you want to make sure your dredging comes in three steps. 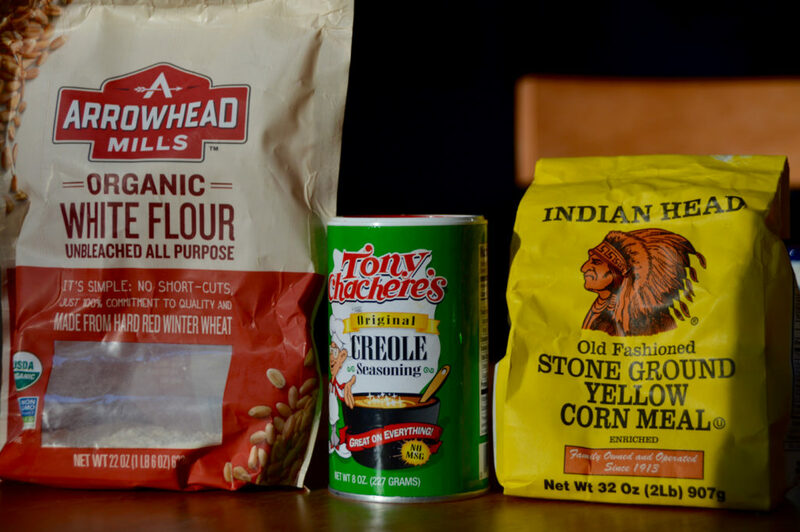 Besides the egg, see below for my dredging ingredients. Step one is to coat the fish in a little flour, then in an egg wash and then in the cornmeal and cajun. 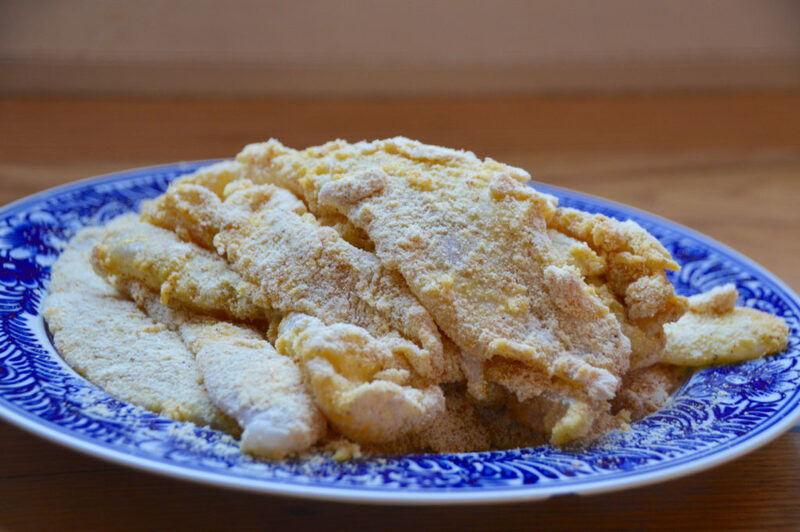 By doing the flour step first, you help the egg to stick better to the fish, thus helping the cornmeal to stick to the egg, making for a better, crispier fish stick. I used just enough olive oil to cast the bottom of the skillet, then set the heat to medium and let the fish slowly fry and brown up. I served it with some ketchup and BBQ sauce so people had choices, and made a big salad and some roasted garlic potatoes to go on the side. It was perfect, and brought me right back to that delicious day I had in the south so many years ago. Click on the recipe below to print or click here. Enjoy!